V.W. Brother R. E. Parkinson, in his volume on the more recent history of the Grand Lodge of Ireland, devotes almost two pages to Sir Rollo Gillespie and his monument at Comber, Co. Down - the only public Masonic monument in Ireland. All of you, I hope, are familiar with Brother Parkinson's book, and my aim this evening is to expand and augment his account. 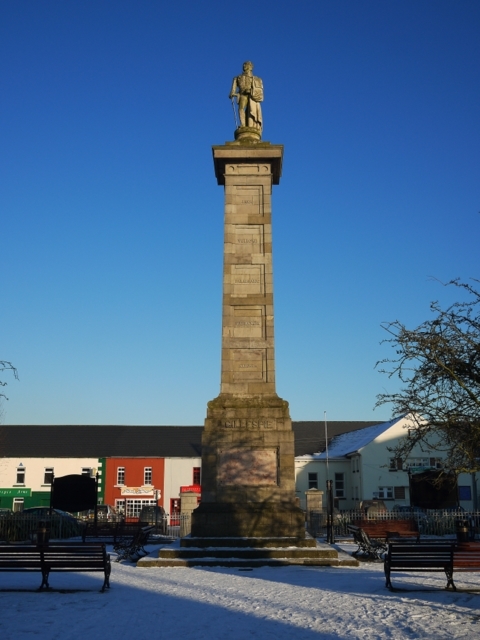 But for the benefit of those of you whose memory of the book is somewhat hazy, I should remind you that Hugh Robert Rollo Gillespie was born in the Square, Comber on 21st January, 1766. His parents hoped he would follow a legal career, but young Gillespie had other ideas. 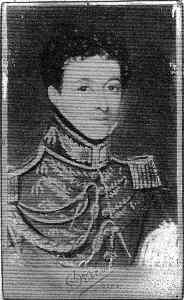 When he was only seventeen he was gazetted a cornet in the 3rd Irish Horse (later the 6th Dragoon Guards) and served in Ireland, the West Indies, the East India and India. Gillespie had an adventurous career, and a biography of this gallant soldier would make absorbing reading(1). In 1814 he had reached the rank of Major-General, and was in charge of one of the four columns in the invasions of Nepal. He was present at the attack on the small hill fort of Kalunga, which was perched in an almost inaccessible position in the Himalayas, above Dehra Dun. Two assaults were beaten back, and Gillespie went up to the front to urge on his men. A few minutes later he was dead, as were 500 of his men. The Death of Rollo Gillespie ~ 31st October, 1814. He was buried at Meerut, where his brother officers erected an obelisk to his memory, and in 1820 a grateful nation had his statue placed in St. Paul's Cathedral. What inspired the freemasons of County Down to erect a monument to Gillespie thirty years after his death? I don't know for certain, but I believe then-action was prompted by a brief biography of Gillespie which was printed in the Northern Whig Office in 1843. The author was Thomas Percy Boyd, a young barrister whose grandfather, Hugh Gillespie, was a cousin of the general. 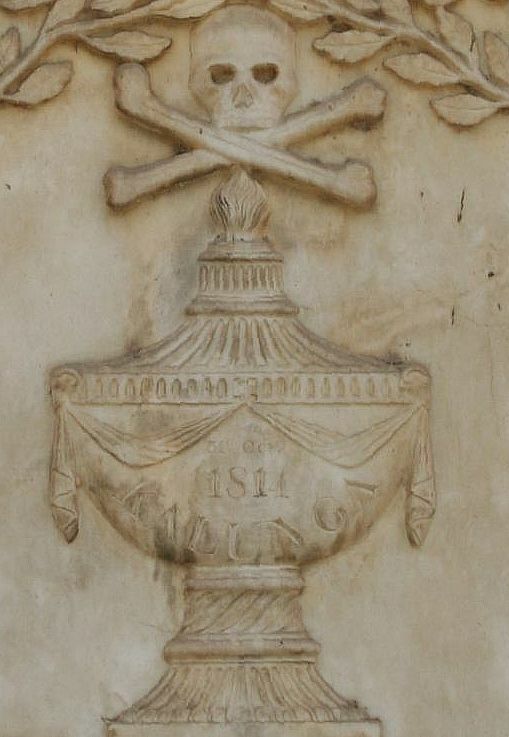 Detail from obelisk at Meerut cemetery, near Uttar Pradesh, India. This pamphlet is so rare that I have been unable to trace a copy, but I assume it must have dwelt on Gillespie's Masonic career. R. F. Gould, the English Masonic historian, states that Gillespie was initiated into freemasonry the same year in which he entered the army - perhaps in the regimental lodge, No. 577, I.C. Against this, at the opening ceremony of the monument, pride of place was given to Lodge 46, Temple of Fame, as the lodge in which he was initiated. As Lodge 46, formerly Lodge 822, only dates back to January 1796, when Gillespie was on active service, Gould's statement appears more likely. 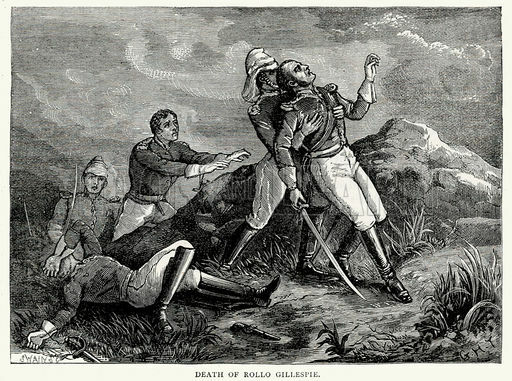 William Thorne, who published a biography of Gillespie in 1816, tells the story that during the blockade of Port-au-Prince Gillespie and a brother officer swam ashore with their swords in their mouths under a heavy fire of musketry. Escaping injury, they landed, only to be taken prisoner and brought before the governor. Only recognition as a freemason saved him from being hanged as a spy. Parkinson tells the story that Napper Tandy, the Irish rebel and a brother freemason, saved Gillespie from capture in Hamburg, a few years later. It sounds an interesting story, but Tandy was dead several years before Gillespie visited Hamburg! The only hard fact I have been able to discover about Gillespie's Masonic career was that he was a member of the Moira Lodge, Freedom and Fidelity, which was constituted in Calcutta on 8th November, 1813. In late 1843 or early 1844 a committee was set up to collect funds for the monument. John Andrews and the rector of Comber, the Rev. Jex Blake, were joint treasurers, and Thomas Percy Boyd and Colonel John Elliott Cairnes, who had served with Gillespie, were appointed joint-secretaries. Subscriptions appear to have come from three sources, the local landed gentry, freemasons, and old soldiers who had served Gillespie. A competition for the design of the monument was held, and the Committee accepted the design of a Mr. Johnston of Belfast. We don't know how much was subscribed or the cost. The official "Opening" of the Gillespie Monument, as depicted in the Illustrated London News, 5th July, 1845. The monument was a Grecian pillar, fifty-five feet high, with a statue of Gillespie on top. One side of the monument bears the following inscription - Robert Rollo Gillespie, Major-General and Knight Commander of the Most Honourable the Military Order of the Bath, born at Comber, A.D. 1766, after a brief but glorious career, fell in battle, before the fortress of Kalunga, on the 31st October, 1814. His last words were - 'One shot more for the honour of Down.' A monument at Meerut, in the East, marks the grave where his ashes rest(2). The Gillespie Monument, Comber, County Down. Gillespie's Statue, St. Paul's Catheral, London. A statue, in the St. Paul's Cathedral, in the city of London, voted by both Houses of Parliament, attests the gratitude of the nation. His own countrymen, proud of the achievements which have shed lustre upon his native land, with a few of his old companions in arms, have raised this column, within that County which claimed his latest remembrance, to perpetuate his memory at the place of his birth. On the east panel are the Gillespie arms, quartered with the ribbon and badge of the most Honourable Military Order of the Bath, on a background of crossed flags and cannon. 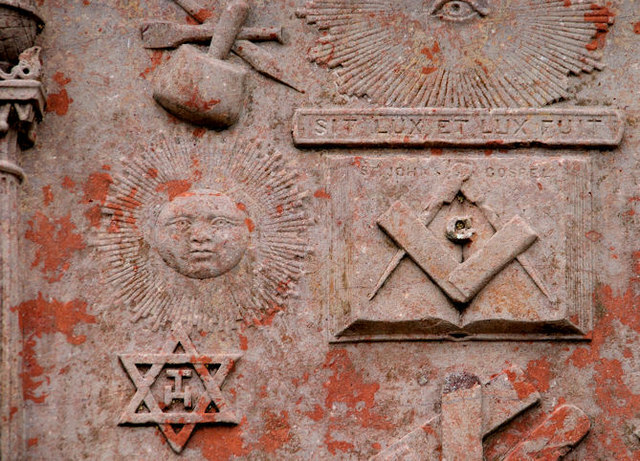 The south panel contains sculptured masonic symbols - at the sides, two pillars surmounted by a globe and in the centre, a hammer, nails, hand holding plumb-line, sixpointed star, right-angled triangle with squares on the sides, sun, moon and stars, and the words, 'Sit lux et lux fuit', and 'Audi, vide, tace'. 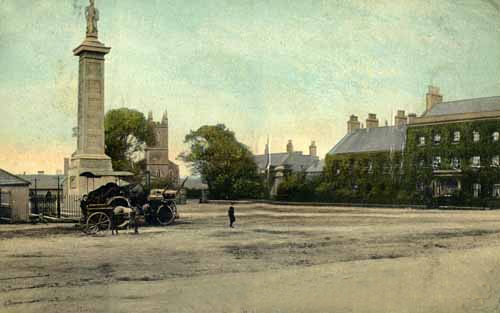 An old postcard of the Gillespie Monument. As a young man Gillespie eloped with and married Anne Taylor, whose uncle had been Lord Mayor of Dublin in 1770. She survived her husband for twenty years and died childless. Who then was the grandson? (4) This is just one more of the unrecorded details in the story of the Monument, and a lot more research needs to be done before its full story can be written. (1) See link to "A Memoir of Major-General Sir R.R. Gillespie" below. (3) Most sources say 31st October, 1814. (4) Gillespie was in fact married twice, firstly to Eugenia Pechier with whom he had two sons and one daughter. A .pdf copy of the text of the above paper can be accessed through the following link ~ "Sir Rollo Gillespie and his Monument by W.Bro. Aiken McClelland". A book entitled "A Memoir of Major-General Sir R.R. Gillespie" by Sir William Thorn and published in 1816 can be accessed through the following link ~ "A Memoir of Major-General Sir R.R. Gillespie"